A man playing a horror game on the HTC Vive was so immersed that he ran and smashed his face into a wall, requiring stitches. Here’s the video. If you haven’t used a VR headset (a real one — Cardboard doesn’t count), it’s hard to understand how real it can feel, as evidenced by many popular VR reaction videos on YouTube. Here’s a video that shows just how intense the experience can be. 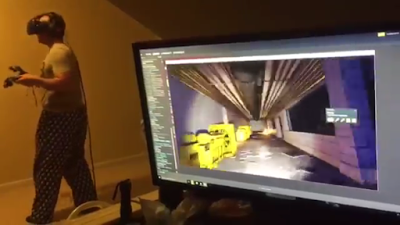 A man was playing Brookhaven Experiment, a horror shooter (available on Steam for the HTC Vive and Oculus Rift). At one point, he ran out of ammo just as a mutated creature lunged at him. Gripped with terror, he instinctively turned around and ran, smashing his face into a wall, and punching holes in the drywall with his face and his knee. The man required stitches but was otherwise fine. The HTC Vive headset survived as well. The video was posted by u/Stradequit.